We are a local team of over 20 experienced plumbers all at your disposal, 24 hours a day, 7 days a week! We provide professional and affordable plumbing to the Newcastle, Lake Macquarie, Port Stephens and Hunter Valley regions. Providing expert plumbing in the moments you need us is our passion and promise. From humble beginnings as a small maintenance plumbing business in 2001, our dedication to customer service has meant we’ve grown to a 20-strong team of plumbers across emergency, maintenance and construction projects and services in the Greater Newcastle region. We are built on a reputation of providing unparalleled plumbing services and water project solution to our customers, 24 hours a day, 7 days a week. Together, we bring 30 years experience to the table, with the inclusion of our construction team (introduced in 2015), specialising in design and construct projects. Enviromate’s construction team have completed major projects across a variety of developments including schools, shopping centres and hospitals. 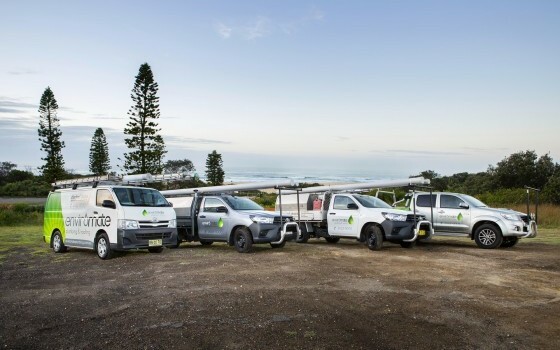 Our Newcastle plumbing fleet now consists of more than 20 vehicles, each specially equipped for either hot water, blocked drains, drainage inspection, pipe relining or general plumbing, and excavators to aid in any major drainage or pipe repairs. At Enviromate, we pride ourselves on delivering quality work at affordable prices in the times you need us the most, and specialising in energy efficient options including hot water systems and our relining technology. You can trust that our technicians are all fully licenced and qualified for the job they are assigned to, ensuring all installations adhere to Australian Standards, and yours. Our same-day service and promise to arrive in a timely manner, maintaining communication throughout the whole process, is part of our trust-based approach. It’s our aim to undo the bad reputation of tradies-past! Our entire fleet is equipped with a GPS system, allowing us to find your closest plumber in an emergency and provide an accurate response time. Continuing this trust-based approach, our biggest point of difference is our upfront pricing. We approach each project with full transparency; adequately scoping the problems at hand and deliver an all-inclusive quote, without any hidden charges. On rare occasions where unforeseen additional costs arise, we will always contact you for approval before carrying out the work. For larger jobs, such as hot water installations or relining, we offer an interest-free payment plan. Please call us to discuss your options. Our plumbing Newcastle team are skilled and highly trained professionals ready to service your home, business or office today! There’s no job too big or small for the project team.